I know that as an adult it is hard to discipline myself to do all of the things that I am supposed to do every day. I used to be so much better at remembering things and tried to make happy habits that filled my body and soul daily. I would walk every night, I would read the bible daily and I would also try to go to church every week. All of those things have lacked lately. I was asked to review a devotional kids book called Jesus Today: Devotions for Kids, and I thought this was just brilliant! We have been told in so many disciplines that the key for us to instill the habits in our children is to teach them young. This book is an awesome tool in teaching kids how to do a daily devotion, regardless of what else is going on in their world. The winner of the ECPA 2013 Christian Book of the Year, Jesus Today™ was written during a very difficult time in Sarah Young’s life. Yet the words of Scripture and Jesus’ own Presence were ever near, bringing her hope and comfort for each new day. Now in kid-friendly language, Jesus Today™: Devotions for Kids assures children that God is in control, that He is good, and that they can put their hope in Him. I was impressed that every devotion is based on Scripture and that it is bible based as Jesus would be talking to kids, teaching kids that Jesus is in control and that He is always there for them is the key I believe to keeping their faith strong. The earlier they learn this the better. I struggle with the lessons as an adult and part of that I think is because I was not taught from an early age. 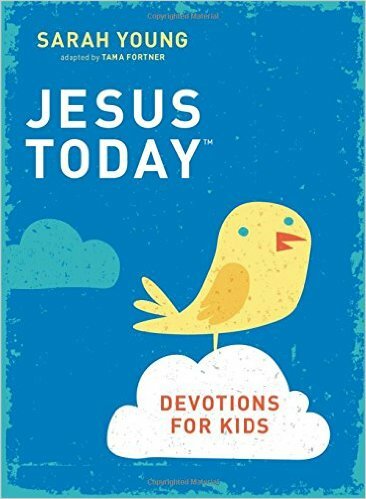 Jesus Today: Devotions for Kids, meets them where they are, the devotions are short, and conversation opening and there are scriptures to reference so that you can take the lesson as deep as you find your child can comprehend. I loved that there is a scripture index so that if your child maybe had a lesson in Sunday School or even if you are studying a certain scripture you can coincide that with the devotional reading that goes a long with that to bring a deeper meaning to the lesson. This world is cruel sometimes, and I think that the more tools we give to kids to help them get through the better they will be in the long term. There are challenges and things that happen, and I truly believe kids just need to know that they are safe, taken care of, and loved deeply. This helps them to learn that on their level and at the same time gives them the lessons and foundation of making a life long habit of reading scripture daily.